I haven't been able to get into the game this morning. I've tried force closing and restarting also uninstalling the app and reinstalling with no improvement. 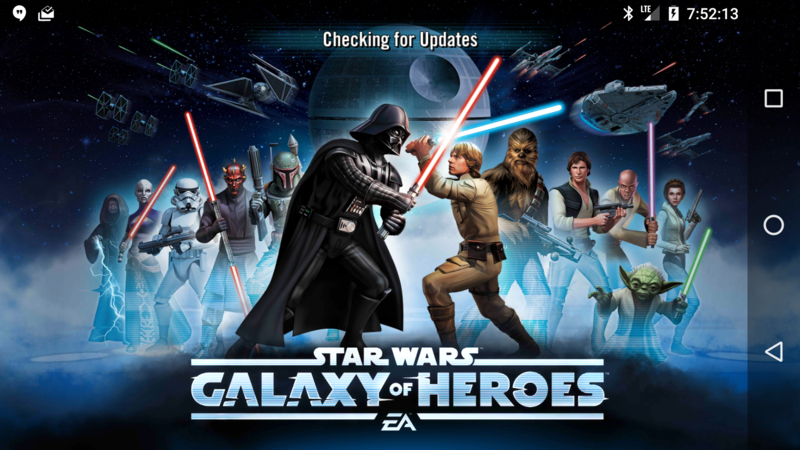 The normal splash screen come up with EA/CG, then the Disney logo, then it just hangs on checking for updates. I don't think it's frozen because if I turn on airplane mode during this point I get a pop-up about connection error so it's not unresponsive. It may be a Google Play thing as I'm unable to log into PoGo either. I made a ticket with EA and chatted with a rep. I got referred to technical support. I'm suppose to get contacted by then via email but no commitment on how soon that would happen. Do you happen to be using a Nexus 5X? Are either of you using AT&T internet? I removed my Google account from my phone, remove the app, added my Google account back, reinstalled the app and it worked. This has been an issue more than a week for me. Ea doesn't seem to think it a priority... they and administrators don't comment in the MULTIPLE threads about this same issue. Many seem to think it is an At&t wifi issue, but i have tried with wifi turned off, others an ivp6 issue, again i've swapped to 4, no change, once a day i get lucky and can log in for about 5 minutes just long enough to spend all my energy and sim tickets and use gems to buy more... can't complete all of the tasks so i can't get a sim ticket award... i have been playing more candy crush and clash of clans... both had been neglected until recently...someone get mickey on the phone, he's got a movie out and needs all marketing options open. I am having issues just like those. It seems I can not connect to my home router. I can turn the data on and WiFi off and I can play at home. I use a galaxy phone. I can connect to my girlfriends WiFi easy also. Reinstalling the game doesn't help. It's got to be something about the routers. I really want to hook to WiFi at home.That would be nice. Tomorrow will be a week I've been playing and last three days I've not been able to play. I'm about to make lvl 35 and even started a guild. I'm way to active to play on just data at home. I just discovered I can play on data only a couple hours ago. This has been flagged as a bug and sent up to our team for review, but it appears this seems to be an issue on the side of the provider. I have AT&T Internet as well and my game wont work anyway EA and AT&T can work together to fix these issues ? Yeah, same problem here for over a week. I have AT&T DSL. When connected to it using WiFi, this problem occurs. When I turn off my wifi & use my LTE data, it's fine. I think it has something to do w/ Google Play's authentication over WiFi, cuz this also happened to Pokemon Go, stuck authenticating when using WiFi. Okay, I seriously need help here. Because I change a simple thing in my normal google account to synchronise my stuff, made SW:GH completely unable to get me in. Everytime I try to log in, it tells me: Your session has expired. Either another device has logged into this account, or it has been 24 hours since you last logged in"
I've been looking around for help and every. single. little. post talks about how you just need to click on the little gear, but how am I suppose to do that, when I'm not even able to get into the **** game? I also have the same problem. I player on 23rd afternoon for the last time. Now when I try to get in it says what OP mentioned. Also, my gmail app does not work but other related apps which share the same google account work flawlessly. Same here. Tried standards like reinstall game, reinstall google play updates and twice reset google play account password. Other games work - so I guess the ball is with EA. Tried SimCity - also by EA - and works fine. Same here. It works as guest or with another account, but not my own account. Haven't been able to log on for the past 15 minutes. I was playing early this morning. Anyone have this problem right now? Yeah, I just posted a thread about it too. Yep. I'm sure part of the update. And will be merging threads. yep, can't currently log on, ill make breakfast and try again...making pancakes, who's hungry?